Towards the Realization of the Rights of Persons with Disabilities is the theme for the 31st NDPR Week. July 17 to 23, 2009. According to NCDA (National Council for Disability Affairs), this year’s theme recognizes the importance of PWDs to enjoy the same rights and opportunities as everyone else. Click here for more info. As we celebrate the 31st NDPR Week, ASP would like to expresses its gratitude through the ASaP series. ASP salutes its partner with Corporate Wings. True to its wide-ranging corporate social responsibility initiatives, SM Supermalls, headed by Ms. Annie Garcia and SM Disability Affairs Committee, headed by Eng. Bien Mateo, extend its arms to Autism Society Philippines by imparting greater service, promoting the welfare of persons with autism (PWA) through education, advocacy and support. 14, 000 people attended Autism Orientation! From 2004 to the present, SM opened its doors to provide lectures on Caring for Special Customers via Autism Orientations to around 14,000 mall guards, tenants, and SM personnel. ASP goes where SM Branches grow! 33 Branches Reached! Autism Orientation is a powerful tool to understanding PWA customers. SM Branches reached : Angeles, Bacoor, Bacolod, Baliwag, Baguio, Bicutan, Cagayan de Oro, Cebu, Clark, Dasmariñas, Davao, Fairview, IloIlo, Laguna, Lucena, Mall of Asia, Manila, Marikina, Marilao, Megamall, Molino, Muntinlupa, North EDSA, Pampanga, Pasig, Podium, San Lazaro, South Mall, Sta. Rosa, Sta. Mesa, Sucat, Taytay and Valenzuela. Demand for Autism Awareness = Expanded pool of speakers! Spearheaded by our dynamic ASP National President, Dang Koe, our speakers increased from one to nineteen (20) disciples, namely: From ASP National: Ranil Sorongon (ASP Executive Director), Grace Adviento (ASP National’s Vice President), and ASP Trustees: Cris Estampador, Peng So, Carmel Almendrala and Alfred Contreras Spilling over to ASP Chapters: Corazon Sugay (ASP Angeles City), Jan Peña (ASP Bacoor & Cavite Chapters ), Noli Vizcocho (ASP Baguio), Angie Abellanosa (ASP Cagayan de Oro), Haidee Fajardo (ASP Cebu), Jane Gonzales (ASP Davao), Lorena Geda (ASP Dasmariñas), Neva Gregorio (ASP Iloilo), Riza Cansanay and Marivic Ramos (ASP Laguna), Adel Martinez, (ASP Lucena), Evert Malapad and Desy Dulay (ASP Metro-South) and Teacher My Sorongon. 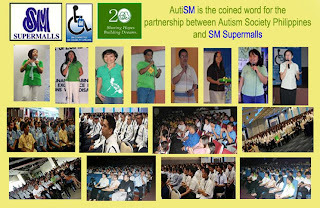 To read about the SM Supermalls and Autism Society Philippines partnership in promoting the welfare of persons with autismclick here to read the AutiSM Story.